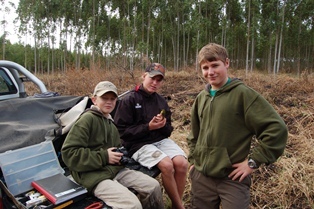 A short holiday to the Richards Bay / KwaMbonambi area allowed some time for ringing, and several weavers were caught. 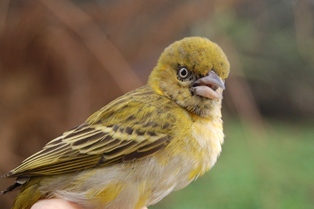 In particular, ten Lesser Masked Weavers all had pale green eyes - nine were classed as adults and one as an immature. They were all in non-breeding plumage altough one showed signs of a mask appearing (see photo). Wing lengths of breeding birds allows sexing of non-breeding birds and about half of this winter catch were males and half females. This confirms that this species has pale eyes throughout the year in adults as suspected (Read the article here and other weaver identification papers here). Weavers caught at Lake Teza and Thulazihleka Pan were Spectacled Weaver (2), Lesser Masked Weaver (10), Yellow Weaver (14), and Southern Brown-throated Weaver (4). Other species caught at these sites were Palm Swift (2), Speckled Mousebird (1), Malachite Kingfisher (1), Golden-rumped Tinker Barbet (1), Black Cuckooshrike (1), Dark-capped Bulbul (2), Sombre Greenbul (3), Kurrichane Thrush (3), Stonechat (1), Red-capped Robin-chat (1), Little Rush Warbler (1), Bleating Warbler (1), Tawny-flanked Prinia (2), Yellow Warbler (3), Olive Sunbird (2), Scarlet-chested Sunbird (1), African Firefinch (3), Common Waxbill (2), Yellow-fronted Canary (12), and Cape White-eye (5). Thanks to Daniel Oschadleus, Brendan and Curtis Roberts for their help on the ringing sessions!